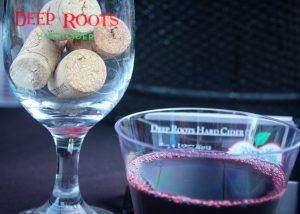 This week, our ‘Winery of the Week’ is Deep Roots Hard Cider. Our “Winery of the Week” is an interesting one this go-around in that it really isn’t a winery or vineyard, however, it still requires the same profound dedication to producing a refreshing and delectable final product with passion and a deep knowledge of horticulture. Deep Roots Hard Cider was founded by Tim Wells in 2014, with its first official batch being bottled in 2015. He and his wife, Lynda, who serves as co-owner and business manager, have a love for hard cider and wanted to share their own style of the alcoholic concoction with the world. Tim had been making hard ciders as well as an array of fruit wines at home since 2007. “I went to school for Plant Science and Entomology at Cornell [University]. While there, I took some horticulture classes that had a field trip to a local orchard. At the orchard they talked about cider and cider apples,” said Tim. Working 12-hour shifts at a factory job, Tim had all the motivation he needed to become his own boss and utilized his many years of personal experience in making cider to create his own business. Since opening their hard cider operation at the family farm along Back Road in Sugar Run, Tim and Lynda have won multiple awards for their ciders, including a gold medal for their Raspberry Hard Cider and silver medals for their Original Cider, Blackberry, Wild Ones, Raspberry, and Blueberry. Tim said his regular customers have their favorites as well, the Raspberry being one of those top sellers. “Raspberry is always the top seller and we have sold out of it every year by Fall. A close second would be our new cider, Apple Crisp. Cinnamon sticks, fresh ginger, and Brown Sugar are added to the cider to give it a unique flavor. It’s only available at our tasting room,” said Tim. The two essentially operate the business by themselves, but often receive much appreciated assistance from family and friends. Although Tim says he may need to add another staffer in the near future. “We are pretty small. It’s only my wife Lynda and myself making and selling at our tasting room in Sugar Run, but we always have friends and family that are willing to help out. We will be in need of a good person to help us with festivals, cider making, picking, and other tasks for 2019,” he said. 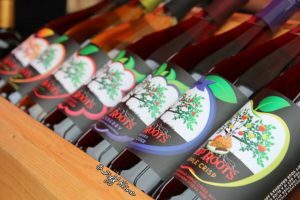 Deep Roots Hard Cider has become a regular attendee of the Wyalusing Valley Wine Festival and will return for the 2018 festival on Sept. 15.